"Look out everybody: a fir tree!....A 5000 year old religion and Frasier Crane is going to bring it down with a 4' tree and tinsel!" "That's wonderful because when we go to heaven I don't want to be separated from you by barbed wire and barking dogs"
Oh and if they had children they would be "half breeds"
Woody is Missouri Synod? Wow. MarcusAureliusWhat if instead of looking for a top-down solution, Catholics and Orthodox tried for a bottom up solution? Individual Roman and Orthodox dioceses, but not entire churches having dialogue with eachother with the goal of intercommunion. For example, Roman Diocese A and Orthodox Diocese A are not in communion with each other. Roman Bishop A and Orthodox Bishop A reach terms for intercommunion between their dioceses. Roman Diocese B and Orthodox Diocese A may not be in communion with each other, but this would not reflect the terms between Roman Diocese A and Orthodox Diocese B. Considering that Catholics already permit Orthodox to communion and in limited circumstances Orthodox permit Catholics to communion, is there any reason why this could not work on a larger scale if it already can on a smaller scale? Maybe not even dioceses but individual parishes with pastors agreeing to communion? ElijahmariaEspecially since the Orthodox are fond of reminding us that the whole Church is located in each episcopal see...thereby mitigating the idea of a universal Church under one pontiff. Must be those invisible Orthodox she always speaks about. We are not talking about some sort of universal resumption of communion. We are talking about the admittance of individuals to the chalice by individual bishops and pastors. We are talking about something that is already happening. Whatever happened in Orthodoxy to ..."where the bishop is there is the Church"...Is that only words or does it mean something? Who is it now that's all hung up on authority? One man one vote. Metropolitans and Patriarchs are just bishops and not even bishops with different hats. What are you telling us?...That there is such a thing as Primatial Power in Orthodoxy? MardukmThe issue here, as usual, is not what the Catholic Church teaches, but what non-Catholics THINK she teaches. ElijahmariaI think you are quite right about what is in the services books as a renunciation. And I will even take it a step further. I think it is intentional. I think it is intentional because I do not think it has, at all, been the intention of most of Orthodoxy to really claim that the papal Church is in formal heresy...even with her petrine doctrine. I think it is an insurance policy to make the convert feel as though it really is a conversion and not just a transfer of authority and to provide plausible deniability if it is ever challenged from outside. The powers that be have posted towards the beginning of the thread, so it must be A-OK.
/\ Mary knows things on a much deeper level than what she is revealing on CAF. She could actually deepen their understanding quite a lot. Of course Hesychios and Mickey and Caravadossi always do an excellent piece of work. I don't even remember what my name was over there lol, and I posted there a good bit. That is my hope about Mary's participation. I'm glad to see her there, even if I don't agree with her all the time. Honestly, I never visited CAF until this morning and I was about half way through their thread under discussion here when I felt compelled to make an observation here for the benefit of others like me who were never involved in past disputes on that board. Certain quotes were picked out of the thread earlier on this thread apparently as an example what is being discussed there. Read by an Orthodox reader here, like me, they are inflammatory and got my curiosity up. When the entire thread is read, even these statements FOR THE MOST PART are not as full of bile or vitriol as the casual reader here might surmise from the extracts. Sadly, this is an all too common form of debate in American society in 2011 - be the topic politics and talk radio, sports and talk radio and religion and talk radio - all together with blogs and the internet for added 'fun.' As a young lawyer, I found it easy to take bits and pieces out of a witness statement that really were hurtful to the other side and make much out of them. I soon learned that unless those statements were really material and relevant to the 'big picture' the wind would be taken out of my sails either upon re-direct examination or by the Judge in his or her opinion. Same goes for any form of argument. I remember an old litigator who took me aside years ago with some advice. It's good for the law and good, in my opinion in any debate: Present your arguments clearly and concisely and when they offend others be prepared to support your point of view and rebut theirs with passion and reason - to allow one of these forces to overpower the other is to begin to lose the argument and no one will be persuaded of your cause. For example, I believe that unless the Church of Rome comes to terms with the role of the Papacy and the Sees of Peter in terms of the early to mid first millenial Church there will be no chance of reunion. Likewise, the dogmaticization of doctrines such as the Immaculate Conception and Papal Supremacy in the 19th century are more than mere 'political' differences of opinion with us. However - as to a broader, Patristic conception of the Apostolic and Catholic Faith of the Orthodox, the Romans share a larger commonality with us than any other of Christ's followers and we ought to strive to find a way to express our shared patrimony and accept some differences in the presentation of that patrimony as was done throughout the conciliar period and the fall of the Iconoclasts. We shared communion with the west for nearly 1,000 years in spite of our differences with Augustine and the concept of 'original sin' just to name one such example. All of us have suffered from the impact of such 'total war' for far too long. By carrying it on 'ad infinitum' all we do is empower the true enemies of Christ and His Church. Already I've registered the fact that to continuously put Orthodox topics under the heading of non-Catholic is a travesty and flies in the faith of all that Blessed John Paul II and Benedetto the Wise ever tried to teach us. I get the party line back but I think the woman moderating the Eastern Catholic forums understands what I am saying and agrees but can do no more than I can. For now, it seems that all threads which only reference Orthodox issues: they go in the non-Catholic section BUT...if the subject and topic can be crafted in such a way that it includes eastern Catholic issues, then it will stay. As Father Ambrose says, the Orthodox contributors there at the moment are doing a very nice job of representing Orthodoxy in a most irenic manner. The Roman rite posters are not all hostile. In fact most of them are not, but of those who are, they are to a fault. Even with that I think there are some excellent threads going. Which is why I posted the posts and (more importantly) the link: the thread in question has absolutely nothing to do with the "eastern Catholics" as that board defines them (also posted there on the forum linked), but yet is it allowed to remain, while so many others get tossed into the "non-Catholic religion," where Orthodox are lumped with Protestants, Jehovah Witnesses, Mormons, Jews and Muslims. If that is justifed, then a thread advocating communion with the Orthodox belongs in "non-Catholic" as well. Unless someone is advocating communion with Protestants, Jehovah Witnesses, Mormons, Jews and Muslims as well. IOW, an agenda afoot, and that is the criteria by which posts and posters are allowed to post, tossed aside into "non-Catholic" or outright banned (with or without the label). That's OK, after all it is on their dime. But let's call a spade a spade. "This forum used to be titled Eastern Christianity. It allowed for discussions on the various issues between the Catholic Church and Eastern Orthodoxy, hopefully in the cause of ecumenism. Unfortunately, forum discussions often deteriorated into fights resulting in a large increase in management time (which we could ill afford). This forum will now be titled Eastern Catholicism. The new focus of this forum is to provide a community for Eastern Catholics and to help Latin Catholics better appreciate the Church's Eastern heritage. Non-Catholics are welcome to participate in compliance with the stated purpose of the forum. Thank you for your participation in this forum and we hope that the changes we have made will contribute to this forum’s success." We understand that there is a wide diversity of expression of theology, spirituality, and discipline between and within the Eastern, Oriental, and Western rites and churches. While these topics may legitimately be discussed in charity, calling into question the catholicity, orthodoxy, or personal faith of another is outside the purpose of this forum and will not be tolerated. Please review our forum guidelines on charity before posting. Thank you." So, I guess if one has issues with them, it's best to take it up with the folks at CAF, no? By the way, I offer no endorsement, approval, or disapproval of their stated purpose or how it plays out in the real world. I've pushed pretty hard privately...I should amend that I've pushed hard enough to be told that the forum administration is aware of what I am saying in my notes. I don't feel threatened...I mean the communications are not at all threatening. But: They are not going to budge. I think it is petty as well as being absolutely substantially wrong and untrue. So far they are not stopping me from commenting on each Orthodox thread in the "non-Catholic" section that Orthodox believers are Orthodox Catholics and that the Orthodox Church is one holy catholic and apostolic. At the moment I don't see how we can do more, except as I said, make the discussion topics a matter of Orthodoxy as it is related to those in the eastern Catholic Churches. Ahhh...I think this is too pessimistic. If I took this tack, I'd have gone from this forum many months ago. It would have been my loss...I believe. There are some very wonderful people here. I've learned a great deal and I am grateful to the administrators and moderators for their general good will. Very few here are so closed to me and my way of thinking and being that they would have ever simply pushed me out...and believe me it could have happened had that been the goal. What I am trying to say is that we've all given a little here and I have found a place where I am comfortable and able to speak freely enough. So I don't expect the administration at CAF to be so willing to bend yet...But I think there may again come a time there when the Orthodox are not called non-Catholics, and the organic tie between Orthodoxy and eastern Catholics is restored. I will continue to hope that and work toward that time...couldn't hurt. I don't think it's pessimistic--just realistic, at least given the state of things now. Remember, too, that if I was pessimistic about it, I wouldn't even be giving you my sympathies and support . It's useful, too, to remember that CAF, as large as it is, is not the Church--just a group a apologists doing their thing. And God bless them for doing it, too, even if I or others don't necessarily agree with all the ways they go about doing it. They are no more the whole of the Catholic Church than this board is the whole of the Orthodox Church. I, too, find it somewhat offensive that Orthodox are considered non-Catholics, and hope and pray that your work at CAF bears good fruit. I'm glad you have the time and energy to devote to it! Thankee for saying so, but there are many there, Orthodox and eastern Catholic, who will make it possible in time to make changes that reflect our ecclesial realities more accurately and with theological soundness. I don't have the time but I am making time for the moment. I am not as at home there as I am here so I will most likely fade in and out from time to time. I am not well received by my eastern Catholic brothers, as some of Irish Melkite's off-handed comments attest here on this forum. They can be a nasty bunch when they put their minds to it. These fellows here can't hold a candle to it. I've noticed that there has been on any discussion board I've been on or visited a group, usually pretty small, of some nasty but highly vociferous and verbose posters who, well, tend to cast a pall over things at times. Folks being what and who they are, there's no reason why CAF should be totally immune to that. Unfortunately . But, keep on pluggin' away, Mary ! I've done my share over the years, of harsh words. But I've lived to see many of them come home to roost in truth. Somewhere along the line I got tired of "nasty"... ...and found a few good Orthodox where I could feel at home...and there it is. Now the mighty powers of this dark world within the Catholic Church have waged war on our holy Church for a thousand years, assaulting us spiritually and physically and militarily with great armies, and also attempting to weaken and wound us with the creation of look-alike Churches with look-alike Patriarchs. They have tried, and they have succeeded, in inflicting great damage on the Church of Christ..
Is it not naive to be too complacent about the new “peace offensive” which has been occurring for only the last 40 years? Just a new tactic which continues the 1000 war against us in the high places of Catholicism. Repeating myself I know, but the 1997 words of Metropolitan Anthony Bloom come as a needed warning, from a man well seasoned in these things - Do not be complacent! The age old enemy of the Church has not fallen asleep. In all my years as a Roman Catholic, I never heard anything remotely like this. Podkarpatska, I need to say that I am not attacking your post and not putting it down. What you wrote was both beautiful and true. But I wanted to balance it with another aspect which is also true. When dealing with a Church which has been an enemy of the Orthodox for so many centuries we have to be both "gentle as doves" (your message) and "wise as serpents" (my message.) Between the two approaches we can slowly proceed towards unity. I recall that one of Ronald Reagan's favorite sayings when dealing with Gorbachev and the rapidly changing USSR was 'Trust, but verify.' Sage advice then, and I would agree that is another way of saying what we both were trying to express! I am there already. With my family, with a multitude of friends. The hawk aspect is needed only for the higher echelons of Catholicism in the ecumenical arena. Who is naive enough to believe that a Church which has fought so strongly, one might even say diabolically, to destroy the Church of Christ for 1000 years has overnight in the last 40 years since Vatican II changed from a leopard into a lamb? I suppose that the above reference indicates thar I am of that 'nasty bunch' with my 'off-handed comments'. I'd suggest to you that a review of such would indicate that my objections are to those of your comments which, in my opinion, reflected a hostility toward Orthodoxy that appears to be at odds with the more conciliatory views that you express in your recent comments to this thread and your views (which I certainly share and for which I initially lobbied successfully in my time at CAF, but which was subsequently abandoned there) that Orthodoxy ought not to be relegated to the Non-Catholic forum at CAF. Mary, my last messages on CAF addressed the prohibition forbidding the Orthodox to use the word Catholic in relation to ourselves and our Church. “There is no doubt that it *is* now difficult for us Orthodox to participate without the danger of denying our faith. For the purpose of this Forum the Moderator has made the decision that we are defined as non-Catholics and she has affirmed this decision several times. ”This puts us in a bind since at the Liturgy and at morning prayers we proclaim that we are members of the "One, Holy, Catholic and Apostolic Church." ”I am not sure how far and under what circumstances we can deny that without denying Christ and His Church. And does our participation here constitute such a denial? We need a couple of theologians (not me!) to decide on this. ”The Orthodox are at sixes and sevens at the moment, and trying to discern if they have a place here. The theological determination that we are not permitted to call ourselves Catholics on the Forum has already caused consternation and I have had two messages on the topic. I referred them to their parish priests to ask him if they may continue to participate without sinning. I shall have to make the same determination in my own case. These were my last posts at CAF. The boom was lowered and one of the staff sent me a message saying that I was banned, and the the ban would be lifted NEVER! "You're certainly free to view yourself as an "Orthodox Catholic" if you wish. But if you are not a member of the Catholic Church, you may not refer to yourself on CAF as an "Orthodox Catholic." For purposes of clear identification, those who choose to mention their religious affiliation on CAF must not claim to be Catholic unless they are in union with the Pope." I was reading a post on Orthodox answers where the person asking the question stated he was Catholic, the response from the Orthodox was "don't call yourself Catholic as we are Catholic, you are Roman Catholic" way to go for for trying to convert the Catholic to Orthodoxy, Great apologetics lol. "You're certainly free to view yourself as an "Orthodox Catholic" if you wish. But if you are not a member of the Catholic Church, you may not refer to yourself on CAF as an "Orthodox Catholic." For purposes of clear identification, those who choose to mention their religious affiliation on CAF must not claim to be Catholic unless they are in union with the :DPope." I remember being a kid, and thinking the One, Holy, Catholic and Apostolic also pertained to the pentecostal Apostolic church in my neighborhood. The one where the women couldn't cut their hair and they spoke in tongues. So I said to the Apostolic kids, "hey, in my church we believe in your church, too!". They were quite puzzled. But later when we got older they told me I was going to hell because I hadn't been saved. Yeah, theres more than a few of those around here. Even some stating that if you've not spoken in tongues you're going to hell. My mom and Step-Dad go to a tongues "church". I cant stand it. I just noticed that by lines like "Orthodox in communion with the Pope of Alexandria," "Orthodox in communion with the other Orthodox" etc. have been removed, while "Orthodox in communion with Rome" are still up. And they said they banned us from using our title "Catholic" to "avoid confusion" and to stop "blurring distinctions." Btw, we are the "Orthodox in communion with Rome." From an Orthodox perspective, the Church in Lisbon (taken as our example) has its own life and identity apart from the Church of Rome, although after the Gregorian reform (11th century) it is true that the Churches of West were almost absorbed by the Roman Church. When then did the (Latin/Catholic) Church in Lisbon cease being the Church or an assured manifestation of the Church? It is hard to say (some may say never) and this requires pastoral judgment when the need arises. One may say that there is only one historic, apostolic, Eucharistic community in Lisbon (the Roman Catholic one - since there is no Orthodox bishop of Lisbon). However, an Orthodox Christian would say that the theology, ecclesiology and sacramental life of the Church in Lisbon is gravely impaired and defective. (Honesty would require us to say that at times, the same can be said of Orthodox Churches, as when the people only communed once a year and when the theology was fully Westernized). You have always presumed a great deal more than you should have. And have never displayed the real courage that it would have taken to actually talk to me personally and find out who I am and what I think and why I do what I do. That is not the Bishop of Rome. One man's not-bishop is another man's canonical bishop. ^I wonder if this poor fellow even knows his picture rather predictably gets knocked around here like a ping pong ball when the going gets silly. And I seriously doubt, although I have no basis whatsoever to have this opinion, that in any way he fashions himself as the 'Pope of Rome and successor to St. Peter', thereby filling a long vacant see as an Orthodox bishop. 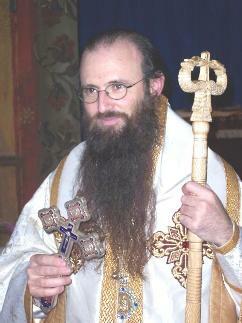 As previously stated, he is an Orthodox Bishop in Rome, in Italy ministering to the Orthodox Christians in his charge. To some of our Roman Catholic apologists here I would remind them of two things: above all this is an Orthodox Christian forum and unlike the CAF you don't get banished from here into the never-never vaporous lands of the 'ethernet' worlds for self-identifying yourself as "Catholic", "Roman Catholic" or whatever. Nor do any of us who give you the courtesy of referring to you and your co-religionists as 'Catholics' or 'Roman Catholics' receive any moderations or warnings from our mods. Let's face reality here. We both refer to, and believe that each's particular Church is the 'One, Holy, Catholic and Apostolic Church' in our theology and our practice. At the present time (newsflash!!!!! -stop the presses....this happened in 1054 AD after all!) the Orthodox do not believe your church to be that 'One, Holy, Catholic and Apostolic Church' and you don't believe that we are such. Wow! How many of us don't know that to the extent that we have to hammer it over and over again. But we are taught that Orthodoxy is one, holy, catholic and apostolic. That lesson may not stick with many but it sticks with enough for the time being. Your lecture is not out of line of course but you keep repeating that we do not see you as one, holy, catholic and apostolic and that is simply not true. You'll remember that you are welcomed to our chalice in a Church where there is no "open" chalice. Rather than seeing that as a good thing, the offer is handed back...generally with a sneer and a reminder that we are not welcome at your chalice. So next time, please keep that in mind when you lecture about how we see one another. Rather than seeing that as a good thing, the offer is handed back...generally with a sneer and a reminder that we are not welcome at your chalice. So next time, please keep that in mind when you lecture about how we see one another. Your exposure to Orthodoxy is horribly limited if it causes you to say such things. Generally speaking the Orthodox are rather apologetic on the occasions when they have to tell Catholics that we do not commune any but Orthodox. Priests having to say something to Catholics who unexpectedly present themselves at the chalice will usually say something along the lines of "We're not in communion. I'm sorry." or "Our bishops are not in communion and we are not allowed lo be either." It is NEVER done with a sneer. You should not claim that! I have never presented myself for communion at an Orthodox church. However, the distaste, when it is revealed I am Catholic, is obvious - from laypersons. Of the handful of Orthodox clergy I have met, none of them have made me feel as if I were unwelcome or demeaned. I do admit, I have come up to kiss the chalice and receive a blessing (a practice which was taught to me at an OCA church the first time I visited, while I was a Roman Catholic catechumen). On occasion, I have come forward to kiss the chalice and the priest has attempted to commune me before I can tell him I am not Orthodox.